The unison version of this work was written for the West Jefferson Middle School seventh grade choir. Their director wanted a theme of inclusion. We both agreed that Edwin Markham's Outwitted was a great fit. This piece is written with spoken sections. 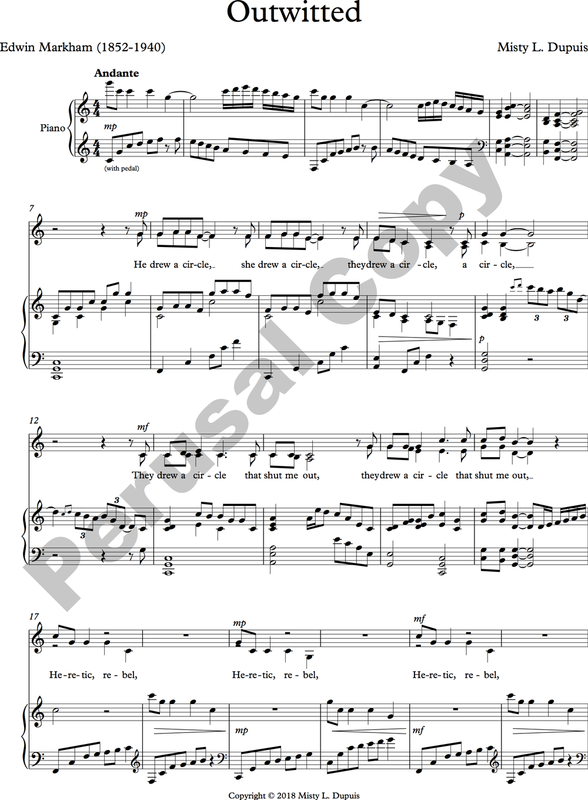 The choir is welcome to use either the suggested words and phrases listed, or they are welcome to personalize the piece for their particular group and create their own words and phrases. They may claim ownership with the piece in this way by tell their own stories. A basic piano part is written to be played during the spoken sections, but the pianist may feel free to improvise during the those sections of the work. Outwitted He drew a circle that shut me out – Heretic, rebel, a thing to flout. Be Love and I had the wit to win: We drew a circle that took him in! This piece runs at about 3 minutes and 45 seconds. It was written for a beginner level, middle school ensemble.